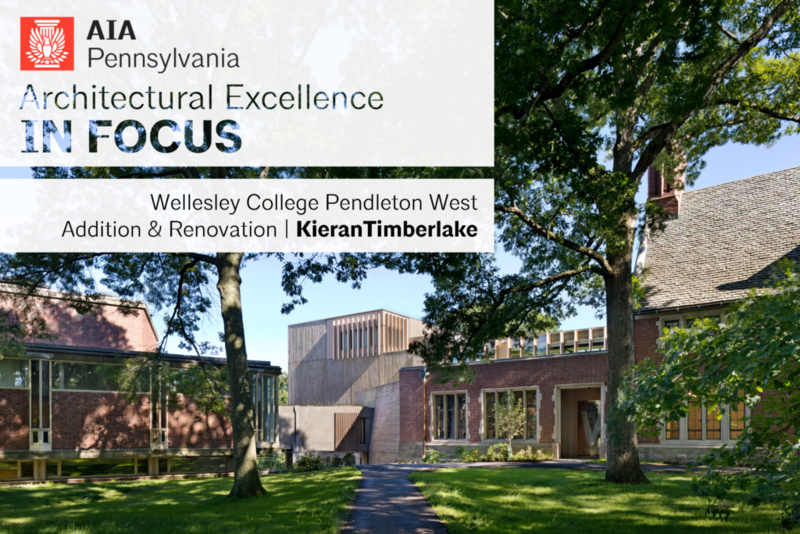 In 2018, AIA Pennsylvania will be taking a closer look at projects honored with 2017 Architectural Excellence Awards with the series, “Architectural Excellence in Focus.” KieranTimberlake’s Wellesley College Pendleton West Addition & Renovation was honored with the 2017 Silver Medal, the most distinguished Architectural Excellence Award bestowed by AIA Pennsylvania. Built in 1934 to house Wellesley College’s Chemistry Department, the west wing of Pendleton Hall was repurposed for arts teaching nearly 50 years ago, but became inadequate as the arts curriculum evolved. The adjoining Jewett Art Center, designed by Paul Rudolph and built in 1958 to host music and art rooms, lacked rehearsal space for the school’s growing music program. Wellesley’s goal of consolidating the two buildings at an important campus crossroads helps establish the college’s prominent arts departments as a unified fixture on the Academic Quadrangle. Pendleton’s classrooms and corridors were cleared and converted into open, evolving, and efficient 21st century art studios, while an addition that unites the two buildings makes room for the music program with an acoustically tuned rehearsal hall, salon, and classroom. Honoring and extending a nascent planning vision, the addition frames the western edge of the Quad as Wellesley’s new front door to the arts. The unification of Pendleton and Jewett extends the college’s arts teaching, which crosses boundaries between the visual arts, art history, criticism, and music. By modernizing and maximizing existing space, Pendleton West now hosts additional programs like digital arts and media. Large, windowed, open studios let the art programs overlap and expand as needed. Building system upgrades enhance the environmental health and safety of students engaged in sculpture, painting, printmaking, and more. KieranTimberlake takes pride in Pendleton West’s embodiment of place and sense of craft. In a Q & A with AIA Pennsylvania, KieranTimberlake’s team cited the complexity of the program paired with a shortfall of space as the most challenging aspect of the project. Their team worked to resolve a myriad of technical challenges with poetic responses. The buildings house an array of space types including music performance, rehearsal, lecture, 2D studios, sculpture shops, foundry, printmaking, papermaking, gallery and critique space, lighting stage studio, digital editing, sound recording, offices, and informal gathering spaces. Many of these uses have extensive and potentially competing technical demands to control noise, contaminants, light, and materials. The overlapping and intimate proximity of such varied activities required careful treatment of enclosures, equipment, ventilation, and lighting to ensure spaces are functional, safe, and uplifting to inhabit. The result is a building where large groups and individuals can simultaneously experiment and learn, unburdened by place.